This Nordlys Ellipse IPL laser effectively treats a wide variety of skin conditions, including unsightly Rosacea, by using a combination of fractional and infrared lasers in one device that can cover both small and large areas of the body. In this article we discuss how the Nordlys Ellipse IPL laser treats Rosacea. Rosacea is a frustrating and embarrassing chronic condition in which adults experience facial erythema (redness) and sometimes pimples. Unfortunately, the exact cause of Rosacea is unknown. Rosacea can vary from mild pink “flushing” to telangiectasia (a dilation of the capillaries, which causes blue, red or purple clusters). 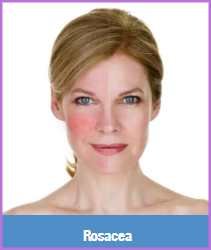 Rosacea can also have different densities and depths. The Ellipse treatment offers the ability to treat Rosacea WITHOUT harsh antibacterial washes and topical creams or dangerous drugs or antibiotic pills. A single Ellipse IPL Laser Selective Waveband Technology (SWT®) treatent can effectively and dramatically reduce or elliminate the facial redness of Rosacea. The Rosacea laser treatment procedure actually removes the face’s superficial vessels that are the cause of the facial redness. Ellipse laser treatments use specific pulsed light frequencies to target and destroy the blood vessels. This high-tech laser system also eliminates unnecessary and potential harmful wavelengths, allowing only those that are beneficial to the treatment, so that the surroundin g skin is not harmed. A full facila laser treatment for Rosacea takes only 20 minutes, with no recovery or down time. Yopu will see immediate results, and over time the skin’s appearance will continue to gradually and natural improve. Birmingham double board certified plastic surgeon Dr. Ali offers the absolute best, state-of-the-art technologies in skin treatments, and wrinkle and line reduction. In addition to Nordlys Ellipse IPL laser skin treatments, we also offer Fraxel 1550 laser treatments as well as ThermiSmooth radio frequency skin treatments. Each laser skin treatment begins with a professional skin consultation. Treatments are selected and optimized to meet the specific needs of each client with the most innovative and comprehensive products and technologies. For optimal results offer custom packages of laser treatments, under the guidance of medical aesthetician Ramona. Schedule a laser Rosacea treatment – and then relax in our Birmingham Med Spa, while we get rid of the annoying redness and make you look and feel more confident and attractive!